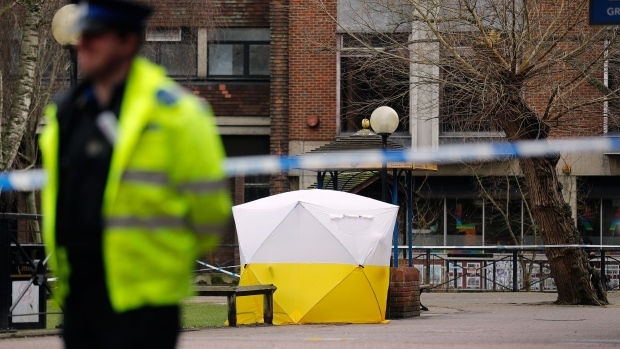 LONDON -- British police said Monday that they don't know what made a man and woman sick at a restaurant near where former spy Sergei Skripal and his daughter were poisoned -- but it wasn't the nerve agent Novichok. The police force said that because of the previous incidents "tests were immediately carried out which enabled us to rule out that the pair had been exposed to Novichok." Detective Sgt. Jonathan Davies-Bateman said "tests are ongoing to understand what, if anything, the pair have come into contact with which may have caused them to fall unwell." "At this stage, it is unclear as to whether or not a crime has been committed," he said. Health authorities say there is little risk to the public in Salisbury, but acknowledge they can't be sure whether all of the nerve agent has been found and removed. Salisbury City Council leader Matthew Dean tweeted that there had been "a number of false alarms since the Skripal poisoning." He said it was correct for emergency service personnel to start with a "highly precautionary approach until they know otherwise."